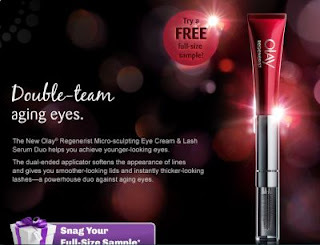 Sign up for a free full sized sample Olay Lash Serum Duo. Click the link below to go to the Vocal Point website. Once on their site click on" Snag Full Sized Sample" Note* Must be a Vocalpoint member; limited quantities available. Only one packet will be mailed per member. Full-size sample of Olay Lash Serum Duo accompanied by coupon for $1 off New COVERGIRL Clump Crusher by LashBlast Mascara. Please allow 5-7 weeks for delivery.